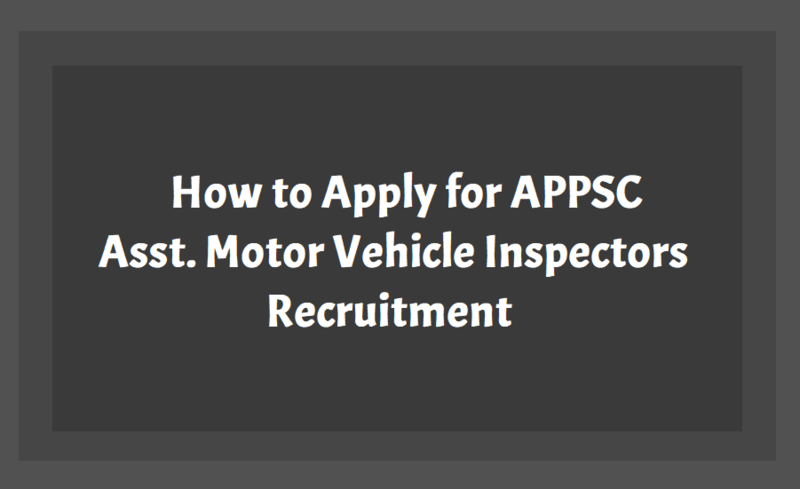 How to apply for APPSC AVMI Assistant Motor Vehicle Inspectors Recruitment 2018: APPSC AVMI Recruitment 2018, Apply online for 23 Assistant Motor Vehicle Inspector posts. The Andhra Pradesh Public Service Commission (APPSC) has given notification for recruitment of Assistant Motor Vehicle Inspectors in AP Transport Subordinate Service for 23 vacancies. The scale of pay is Rs.31,460 to 84,970 and the age limit is from 21 to 34. Applications should be filled online from December 12 to January 2 and the examination would be held on April 17. Candidates having a degree or diploma in Automobile Engineering or a degree in Mechanical Engineering are eligible for the AVMI Recruitment test. The candidates should register through the One Time Profile Registration (OTPR) on the Commission’s website, before heading for submission of application. A user ID is generated and sent to the mobile number and email ID of the candidate. The applicants need to apply for the post using the OTPR user ID through Commission’s website. "Physically challenged candidates are not eligible for the posts", the notification read. Interested candidates are requested to follow the official website for further updates on the exam.